Budapest this week marked the transition into the third and final phase of its candidature to host the 2024 Olympic Games by releasing a series of stunning computer generated images of the downtown Olympic Park Cluster, which it calls the heart of the Budapest Games concept. 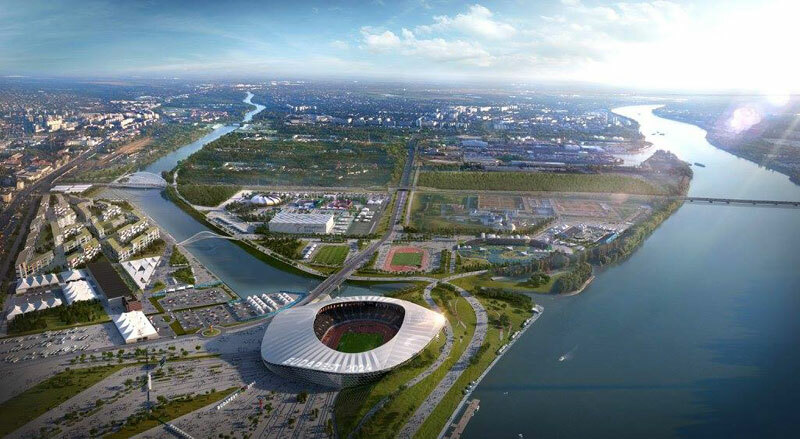 Attila Mizser, Director of Sport and Venues for Budapest 2024 said, “we feel this is a right-sized Olympic Park, appropriate for a new era of the Olympic Movement. The compactness is reflective of our concept as a whole – the average travel time for athletes from the Olympic Village to their sport venue is a remarkable 12 minutes”. Budapest 2024 Chair Balázs Fürjes said,”the city will become a single Olympic Park, fed by the energy and vitality that radiates from the Olympic Park Cluster and the athletes”. The Olympic Park Cluster is the largest of the seven venue clusters and contains nine competition venues housing ten sports and a Media Village. The athletes will also be housed in the Olympic Village that will provide 16,500 beds in 12 modern, medium-rise blocks. The location of the Olympic Park Cluster, known as the “Budapest Southern Gate” is a prime inner city location. It reportedly fits the bill for the International Olympic Committee’s Agenda 2020, that requires bid cities align Olympic development plans with long-term plans already in place for the community. The legacy plans for the venues closely match Agenda 2020, providing upgrades to several facilities that already play an important role in the suburbs. Seventy per cent of the Olympic Village will be converted into “cluster” housing and 30 per cent will become student apartments, a legacy concept that aligns with the government’s priority to enhance student housing in support of the growing education sector. Budapest is bidding for the 2024 Olympic and Paralympic Games among rivals Los Angeles and Paris. The host city will be selected by the International Olympic Committee (IOC) September 13.